Turns out OTT '80s fashion trends like puffy sleeves, ruffles, and shoulder pads are more fashionable that you thought. 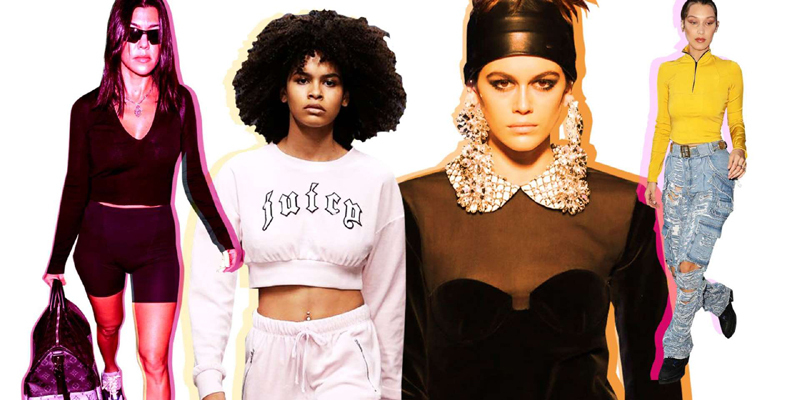 Here, 30 of the best styles from the decade that are making a modern comeback - both on and off the runway. Most commonly associated with Juicy Couture, velour was a material that popped up on sweaters and tracksuits everywhere in the '80s. 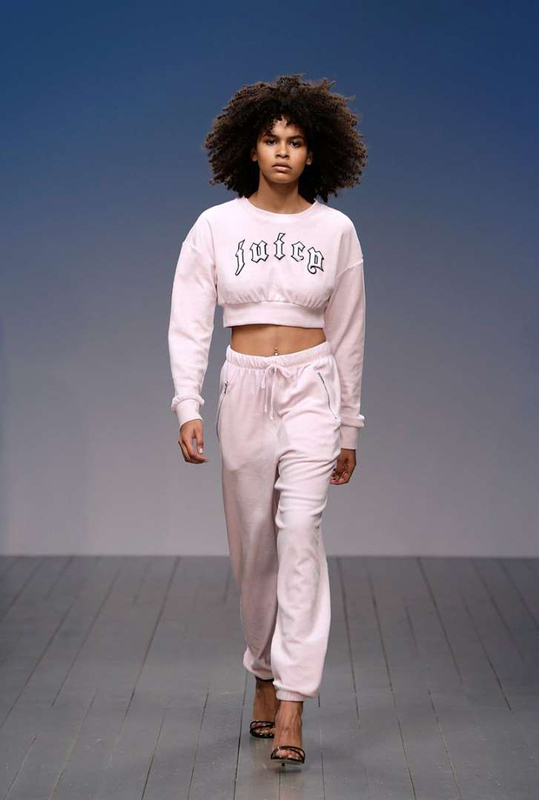 The velvety, stretchy fabric has come back in a major way, most recently when Juicy Couture released a collaboration with VFILES, as seen here during London Fashion Week in February. Patchwork denim rose in popularity in the '70s and continued on as a major trend during the next decade because of its quintessential Americana aesthetic. 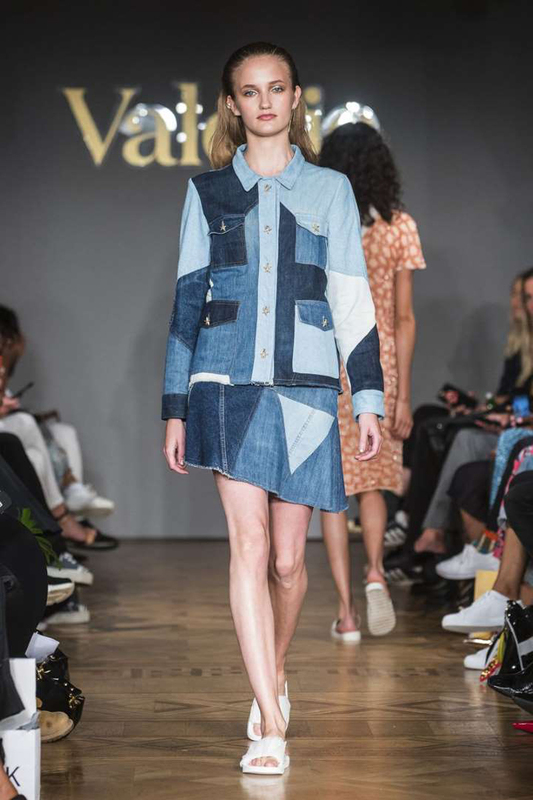 Here, a model wears the look at the Valerie runway show during Stockholm fashion week in August 2017. When you think of prom fashion during the 1980s, shiny lamé dresses are probably the first thing that comes to mind. 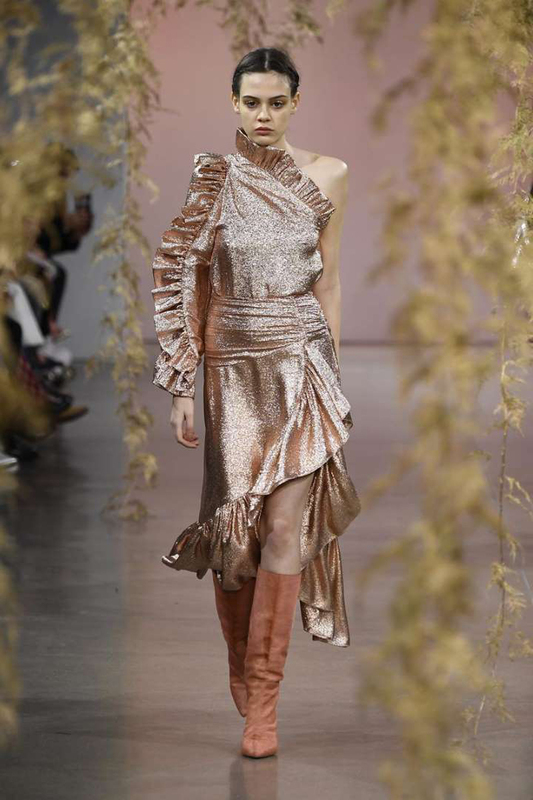 Here, a model at the Ulla Johnson runway show in February wears a modern take on lamé: a one-shouldered metallic dress with ruffle details paired with suede boots. This shoulder-baring style is found in every clothing store today, but it was commonplace in '80s classics like Flashdance, Heathers, Pretty in Pink, and Ghostbusters. Whitney Houston and Madonna were also fans of the style during that period. In this photo, a model walks the Zimmermann runway show in September 2017 wearing an off-the-shoulder floral top and matching skirt. You might know them as "mom jeans," but this high-rise, slightly baggy style has really taken off in the fashion world recently. Goodbye for now skinny, low-rise jeans. Here, Jordyn Woods wears on-trend wide-leg, past-the-bellybutton jeans backstage at the Chromat show in September 2017. Headbands (especially when worn with teased hair) were such a staple of the '80s - rockstars like Steven Tyler and pop queens like Madonna often wore the accessory. Here, Hailey Baldwin got in on the look at the September 2017 amfAR gala in Milan. Ankle socks worn with heels or sneakers were a classic '80s style - the slouchier, the better. While in the aughts it was more about hiding your socks with lower-rise pairs, now, it seems showing your sock is making a fashionable return–from street style stars pairing them with designer pumps, seen here during Paris fashion week, to off-duty models wearing them with their dad shoes. Statement jewelry like rhinestone earrings - especially in clip-on form - necklaces, and bracelets were popular in the '80s because their loud look went perfectly with the decade's bold perms and colorful eyeshadow. Tom Ford's runway show in February channeled the era with his excessive silver jewelry, seen here on Kaia Gerber. The fact that ruffles were a major '80s trend comes as no surprise when you imagine, again, prom during that time. Nowadays, the style has become more refined, like the frilled sleeves and hem of this maxi dress at the Tory Burch runway show in February. One of the edgier '80s styles was acid-washed denim, which reflected the rock 'n' roll culture of the time period. A model at Ralph Lauren's runway show in February wore the style by sporting a bleached jacket and matching jeans. Black sheer tights were a red carpet staple worn by actresses from Sarah Jessica Parker to Vanessa Williams, and three decades later, the trend is popping back up. 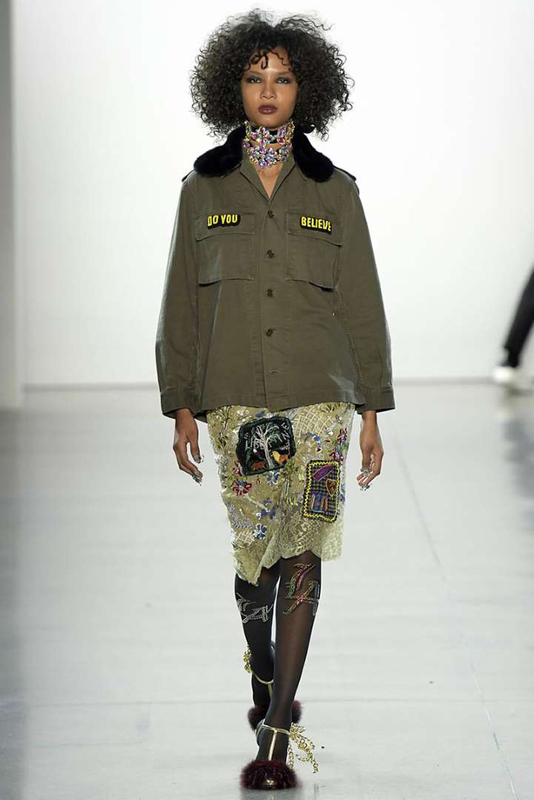 At Libertine's runway show in February, a model sported black transparent tights (albeit with some embroidery), paired with a skirt and jacket. Another OTT '80s trend? Animal-print everything. The decade was all about wild, loud patterns, so the spots and stripes of leopards, cheetahs, and zebras were everywhere. Animal print made a serious comeback in various Fall/Winter 2018 collections, such as Tom Ford and Max Mara, pictured here. Shoulder pads are arguably the fashion trend most synonymous with the era, and while it's a silhouette often ridiculed, designers have recently brought it back by making it more modern. The extra padding exaggerates your shoulders, but can still look chic, as seen in this fitted, sharp blazer at the Louis Vuitton runway show in March. 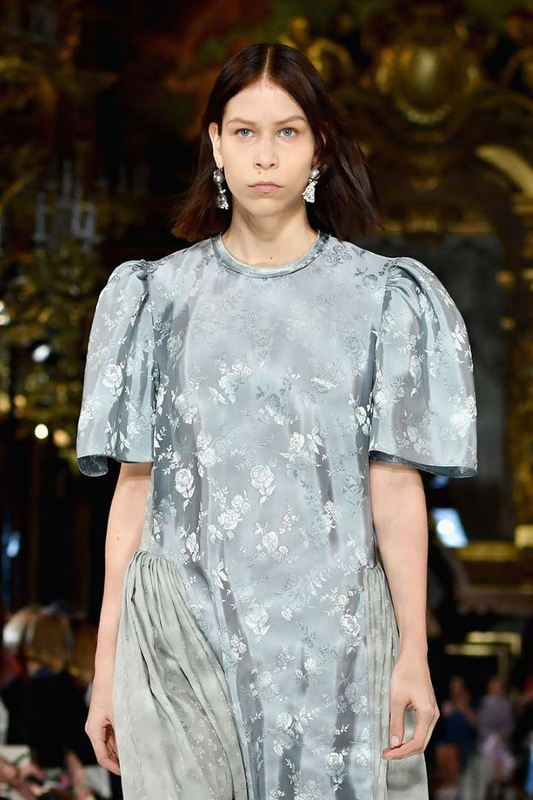 Along similar lines as shoulder pads, statement puffy sleeves have also become fashionable again, as featured at the Stella McCartney runway show in March. From Harley Davidson to Disney's Mickey Mouse and Coca-Cola, wearing a logo was also a huge trend of this period. Branded merch has resurfaced with the rise of "logomania," such as this Disney-inspired Opening Ceremony runway show in March. Skate culture really took off during this time, and Vans classic checkerboard pattern became super popular thanks to Jeff Spicoli from Fast Times At Ridgemont High. 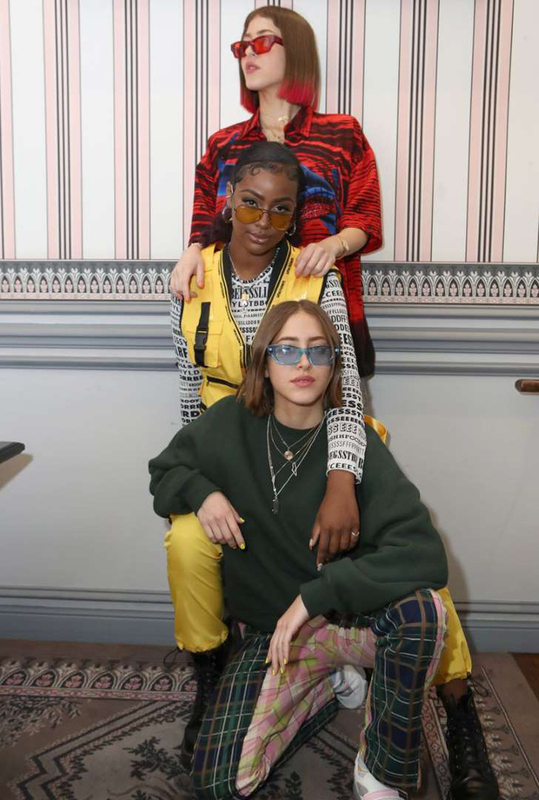 In addition to those infamous slip-ons, the brand's "Old Skool" silhouette later gained traction, and continues to appear today, as shown in this picture from Paris Fashion Week in March. You might immediately think of Flashdance when you hear the term "leg-warmers," but this style goes beyond the '80s hit that helped popularize it. 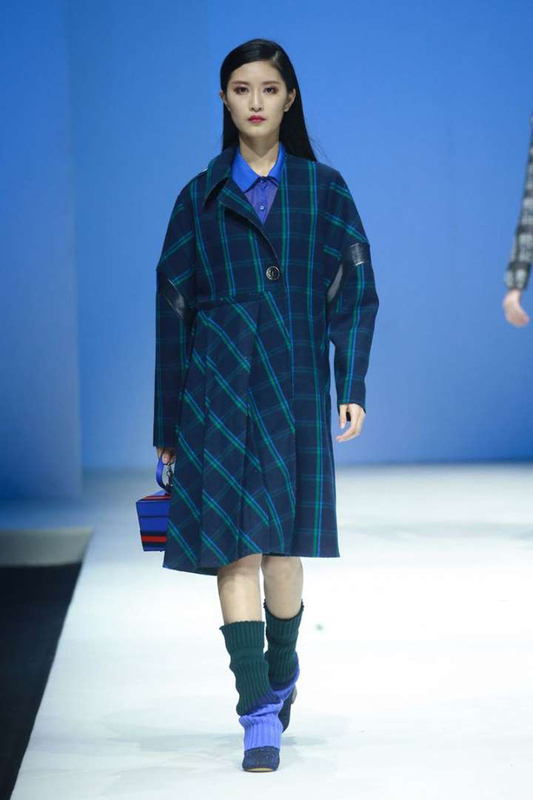 In March, these leg-warmer shoes hit the runway during China Fashion Week, proving that they're not just for dance class. Melanie Griffith gave everyone major powersuit inspo in the 1988 movie Working Girl, and the trend has sprung back up today, appearing on models like Karlie Kloss and, most recently, royalty, when Meghan Markle was spotted in the style. You could easily find people in the '80s club scene layering bras and shirts under mesh fabric, and the same holds true today. At Coachella, which is basically the millennial version of a club, Victoria's Secret model Alessandra Ambrosio wore a black mesh crop top over a white bralette with black high-waist cutoffs. If you remember watching Olympic figure skating in the '80s, or if you have at least seen pictures of the outfits, you'll know that sequins were definitely a Thing. Now, the trend looks a little more polished. 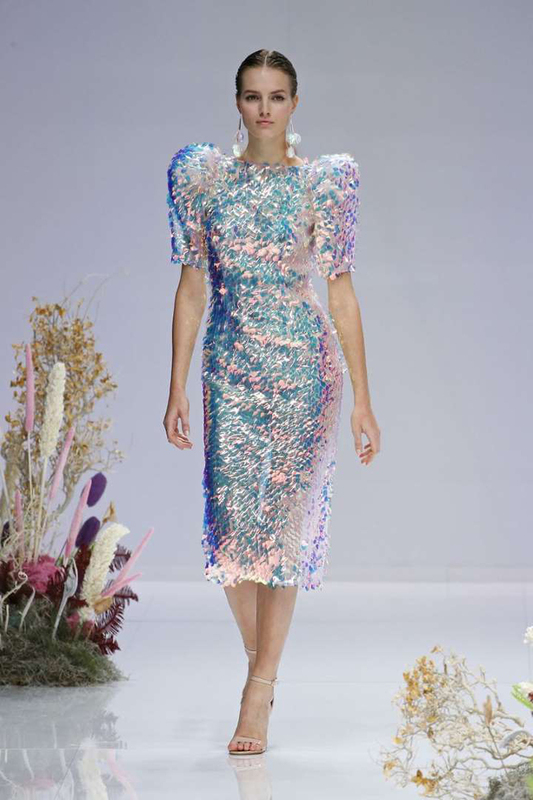 Take this iridescent sequin midi shown at Barcelona Bridal Week in April, for example. Sunglasses with colored lenses, such as these red, yellow, and blue ones spotted at a Ray-Ban party in May 2018, were all the rage just three decades ago. In in the fictional high school halls of '80s flicks like Heathers and Teen Witch, mini skirts were rampant. Here, Sophie Turner and Laura Harrier wore short skirts to attend Louis Vuitton's Resort Collection in May. Whether they were made from leather or nylon, bomber jackets reached their peek coolness in the 1986 classic Top Gun. 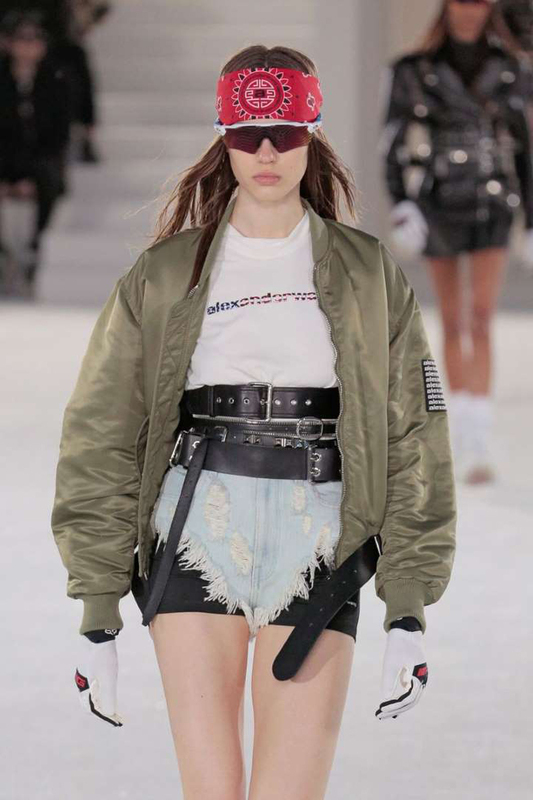 The silhouette has now been adopted by streetwear brands like Stüssy and Supreme as well as fashion designers like Alexander Wang, whose resort 2019 runway show in June featured a plethora of bomber jackets, like the one pictured here. Have you seen a Richard Simmons '80s workout video? Well, either way, fitness gurus from that period definitely made the case for neon colors with their bright sweatbands, leotards, and leg-warmers. The Kardashian-Jenners have have been wearing the blinding hues A LOT as of late, such as this neon orange mini dress Kendall wore in June to a LOVE magazine party. Madonna and Princess Diana were fans of bike shorts back in the day, and, thanks to Yeezy's new designs, Kim Kardashian has really gone all in on the trend, and the rest of her fam quickly followed suit. Case in point: Kourtney Kardashian wearing these black shorts at the airport, paired with a simple long-sleeve shirt and Yeezy sneakers. Madonna's white lace dress with matching gloves was iconic when she performed "Like a Virgin" at the MTV movie awards in 1984, and it cemented lace as a definite trend of that decade. Now, it's back again, as seen on model Adwoa Aboah when she wore this strapless black number at a Chanel party in June. The blossoming grunge culture of the '80s, thanks to bands like Nirvana, Pixies, and Sonic Youth, gave way to edgier trends like super distressed jeans. Bella Hadid sported a torn-up pair in June 2018 with a bright yellow top and black sneakers. Victoria's Secret Model Leomie Anderson wore a white high-cut bodysuit in July 2018, but the pelvic bone-baring style is totally reminiscent of those iconic bright red one-pieces worn in the television show Baywatch, which debuted in 1989. Olivia Newton John famously wore a pair of skintight black leggings in the 1978 movie Grease, and at the turn of the decade the tight-fitting trend really took off. Designer Jean-Paul Gaultier even had a pair walk down the runway for his Spring/Summer '88 collection. Today, the spandex style has found its way into denim with "jeggings," but the more classic pairs are still thriving as well, like these black ones worn by Gigi Hadid in July. Graffiti artists like Jean-Michel Basquiat and Fab 5 Freddy took off during this time period, and, in 1981, they were featured in Blondie's "Rapture" music video. The hip-hop scene of the '80s resulted in streetwear that replicated spraypaint. Now, high-fashion brands from Burberry to Balenciaga, seen here on Taylor Swift in July, are embracing the style.